When I was a kid, a big part of building a model railroad was building communities and industries for the railroad to "serve," as well as adding water towers, coal towers, etc., that served the trains themselves. Of course we could use materials like cardboard and balsa wood that wouldn't hold up outside. Plus O, S, and HO had been around so long that there was a lot of competition among suppliers selling cheap plastic building kits. 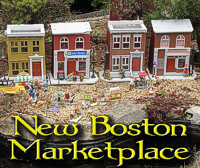 And in a pinch, there was even a used market, although that was usually a cousin or neighbor boy who had "outgrown trains" and would sell his stuff to you cheap. When I got interested in garden railroading in the early 1980s, I assumed that I would have, not only trains, but also communities and railroad structures, just like I had indoors. Then I realized that most of the structures I wanted would cost as much as a small locomotive - a dynamic that did not exist in the indoor scales. So I gave up asking advice from people who didn't seem to think there was a problem. After all, I had a long history of scratchbuilding and kitbashing, so I cobbled some things together, including "trashbashing" about a dozen buildings together from toys and birdfeeders. After realistic paint jobs, detailing, and graphics, they made a fairly respectable appearance, if I say so myself. 20-odd years later, the pressed-wood and Masonite components of my "trashbashed" buildings were on the verge of disintegration, and I started keeping my eye out for "too-cheap-to-pass-up" used buildings and kits to replace them when they finally gave out. I even put few used Piko buildings out without properly preparing them for the outdoors, since they were already glued together. I trashbashed several more buildings, taking detailed photographs and writing up my procedures along the way, to "fill in the gaps" left in our original trashbashing article. Though I didn't get all of my 2012 trashbashing projects done in time for "Train Day," I got enough done to populate my permanent railroad and four kids' railroads we set up just for the occasion. I did not get the kits out of their boxes or refurb the kits that needed it. In fact, I came to realize that I probably never would. So I elected to have a garage sale. Sort of. I made a list of all the used buildings and kits that I had decided against prepping for future use on my railroad. I also included some "project" locomotives and cars - damaged or incomplete pieces that I had bought to customize but had never got around to. In January, 2013, I put the list up on one of my web pages and asked a of officer of the Miami Valley Garden Railway Society to send the URL to the members. I promised to bring any of the stuff people wanted to the next meeting. I priced most of the pieces for about what I had into them, or less for the pieces that had damage or excess wear. To my surprise, only one of the "project locomotives" sold, but I got so many e-mails on the buildings that I could have easily sold four times as many. Unfortunately, one fellow who mis-typed the e-mail address and thought he had bought them all was disappointed to find that I had already promised them all to folks whose e-mails had actually gotten through to me. I believe that if I had dragged that stuff to the club meeting without already having most of it promised out, there would been some Black-Friday-style "loud discussions." To make it even more interesting, I went looking for something on eBay a few days later, and saw that the new price of several buildings I'm familiar with has nearly tripled in the last eighteen months! No wonder people were so excited about getting buildings they could afford, even if they needed some TLC. Some people would assume that my "lesson learned" would be that I should have "gouged" my friends more. But I felt that I had priced everything fairly, and I still feel that way. 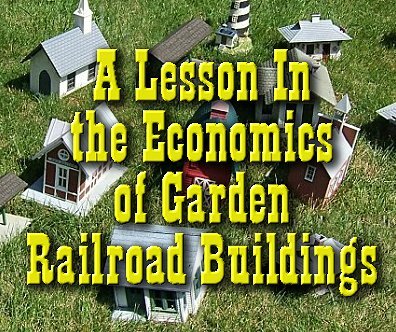 My "lesson learned" was that, thirty years after I suffered my original "sticker shock" about the price of garden railroad buildings, garden railroaders are still looking for alternatives to outrageously-priced buildings. As I think about that, it makes a certain amount of sense. After all, you only need one locomotive per train, and most people can only run 2-4 trains at a time. But if you want little communities for your trains to serve, then you need buildings to represent those communities. How many storefronts do you need to make a believable "downtown" district, even for a small town? 3-5? Plus if you have another town somewhere else, plus an industry or three, plus farmhouses and barns and stations and water towers . . . So if you want to represent the communities that your trains serve, and add in the structures that serve your trains, even a small railroad with two towns apparently "needs" somewhere between 10 and 20 structures. If you're paying close to $100 each for those structures, that turns into "real money" fast. No wonder folks are so interested in acquiring structures that won't "break the bank." Longtime readers know that I've spent over nearly twenty years trying to help people get started in garden railroading without having to take out a second mortgage on their houses. That effort has included a number of articles about acquiring, adapting, or creating buildings or at least parts of buildings, inexpensively. To make those articles easier to find, we've put together a single index for them. True, many of those articles depend on access to resources that are not available to everybody. But hopefully, everyone can find something useful among the ideas listed in our Inexpensive Structures and Building Materials article. Here's the part where I keep my fingers crossed. No, we're not in any danger of putting Pola or Piko out of business singlehandedly. But "behind the scenes," we've been testing other ways to help you put buildings on your railroad without taking too much money out of the bank. So far, we have not had the success rate we'd like before we go public with the new things we're trying out. But with any luck, we'll have something to publish soon, and maybe even something to demonstrate at the June, 2013 National Garden Railway Convention in Cincinnati. So stay tuned. We're on YOUR side, after all.